Direct somatic embryogenesis is favoured over indirect methods for the in vitro propagation of Coffea canephora, as the frequency of somaclonal variation is usually reduced. Ethylene action inhibitors improve the tissue culture response and thus silver nitrate (AgNO3) is used for direct somatic embryogenesis in coffee. It was observed that silver thiosulphate (STS) that is a more potent ethylene action inhibitor, induced a much robust response in C. canephora cotyledonary leaf explants with 7.49 ± 0.57 and 7.08 ± 0.12 embryos/explant at 60 and 80 µM AgNO3, respectively compared to 3.3 ± 0.18 embryos/explant at 40 µM AgNO3. Transient transformation indicated that STS improved the transformation potential of embryos by enhancing Agrobacterium tumefaciens adherence to surfaces. In vitro adherence assays demonstrated that the cell wall material from STS-derived embryos provide a better substratum for adherence of Agrobacterium. Furthermore, blocking this substratum with anti-mannan hybridoma supernatant negatively effects the adherence. The presence of galactose and mannose residues in the decomposed cellulose fraction of STS treated somatic embryos are indicative of de-branching and re-modelling of galactomannan in response to ethylene inhibition. Genes of mannan biosynthesis, degradation and de-branching enzyme were affected to different extents in embryos derived in AgNO3 and STS containing somatic embryogenesis medium. The results indicate that ethylene-mediated cell wall galactomannan remodelling is vital for improving the transgenic potential in coffee. Communicated by Sergio J. Ochatt. The Authors thank the Director of Research, and Dr. Surya Prakash Rao (Head, Plant breeding Division), Central Coffee Research Institute, Balehonnur, Chikmagalur, India for access to the farms and collection of seed material. AK and SPS acknowledge the research fellowship from the Council of Scientific and Industrial Research (CSIR), New Delhi. The authors thank Prof. Paul Knox, University of Leeds, for LM21 Hybridoma supernatant and Dr. Prakash M. Halami and Dr. Padmaja R.J. (Department of Microbiology and Fermentation Technology, CSIR-CFTRI, Mysore, India) for extending help with ELISA. The experiment was partly funded by the SERB, Department of Science and Technology, New Delhi, India (SERB/SR/SO/PS/20/2012). AK conceived and designed the experiments. 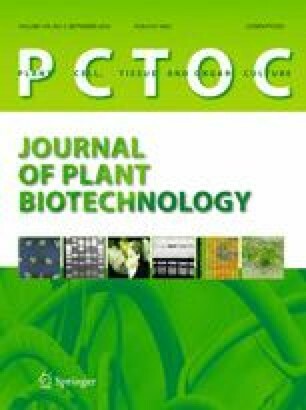 AK contributed to Agrobacterium-mediated transformation, CWM analysis, SEM studies and Quantitative RT-PCR for mannan metabolic genes. AK, SPS and PG contributed to production of stock for coffee in vitro cultures and somatic embryos. AK drafted the manuscript and all authors proofread the manuscript.